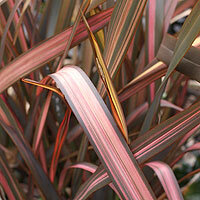 With great colorful foliage Phormium varieties are undoubtedly a very useful landscaping plant in many areas of the UK. The do handle the cold well, however even these tough New Zealanders have a limit. That limit is around -5°C, however with a little extra care they can easily by coaxed through this and even colder condtions. 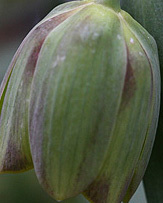 As for hardiness, look at the parentage, cultivars that have P. cookianum as a parent are often less hardy than others. Phormium tenax is also known as the New Zealand Flax, and includes varieties such as Phormium tenax purpurem, tricolor and variegatum as well as cultivars 'tom thumb' , 'sundowner', 'bronze baby' and 'jester'. Phormium cookianum is a smaller growing species often used in hybrids. Phormium plants are available for sale in the UK from mail order nurseries and by post. Growing well in coastal conditions, phormiums are also well suited to growing in containers, again well drained please. So if you are looking for that exotic look, explore the world of phormiums. 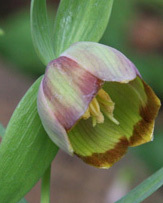 'Yellow wave' have attractive variegated foliage, green and yellow. 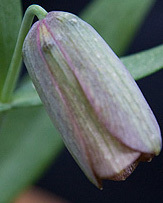 'Sundowner' had red and green foliage. 'Bronze Baby' has new red foliage which turns a nice bronze over time. 'Jester has red foliage with deeper green margins, most attractive. And finally 'Black Adder' deep purple to almost black foliage, dramatic in a container. Phormium grows well in full sun to part shade, it does require a well drained soil and likes a little protection from the extreme cold of winter. The trick with getting phormiums through the winter is keeping the roots from getting to cold or worse freezing. As plants get older, phormiums will natuarally collect leaves, and other materials around the base, gardner's do like to 'clean up', however if you leave the debris around the phormiums over winter you will be doing them a favour. Larger established plants have a greater chance of surviving the harsher winters, new plants need a little protection, a good protective layer of mulch around the base of the plant will help, however in really cold areas it can be a little difficult. So with a supply of straw, dry mulch autumn leaves or similar material, try surrounding the base of the plant with this protective material for winter. In Southern areas phormiums seem to survive rather well without much winter care at all. Propagation by division of established clumps in spring in the easiest wa y to increase the number of plants. Plants can be pruned right back, however we prefer just to trim of the damaged foliage in early spring to improve the appearance. Hosta specialist with over 1100+ varieties for sale. 100 Agapanthus varieties, 25 Phormium varieties, 80 Crocosmia varieties, 42 Rhodohypoxis varieties, plus Trilliums and many more cottage garden perennials shipping worldwide. 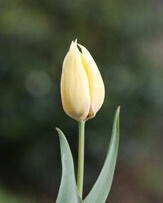 Varied and reliable range of great garden plants and good value plant seeds to buy online.' Lavender, Bamboo, Shrubs, Perennials, Crocosmia, Lily, Potentilla, Plant Seed, Iris, Hemerocallis, Hardy Fuchsia, Hardy Geranium, Herbs, Dianthus, Hosta, Phormiums, Penstemon,Heuchera, Potentilla, Cistus. Small nursery in south shropshire run by husband and wife team selling quality shrubs, climbers & perennials. Specialising in Syringa, Camellia, Daphne, Magnolia, Cornus. Includes:Phormium rainbow queen and others.